Executive elegant, 5 bedroom 4 bath single level home situated on secluded lot nestled into the mountain preserve. Top of the street with breathtaking views! This gorgeous home sits at the top of a cul-de-sac in the gated community of Montana Vista. Beautiful front entry opens to spacious formal dining and living room with wet bar, tray ceilings and large picture windows with stunning mountain views! Designer white cabinets in kitchen, stainless appliances, kitchen island, pantry and breakfast room. Large family room with fireplace and lots of windows. Over-sized Master suite with incredible hillside views and sitting area. Master bathroom with jetted tub, walk in shower and large walk-in closet. Four secondary bedrooms, one with private bathroom. Low maintenance backyard features breath taking mountain views, covered patio, play pool with waterfall, spa and automatic solar triggered awning. Two tone paint, newer fixtures and hardware throughout, Large inside laundry and oversized 3 car garage. Just steps away from your own private access to South Mountain hiking trails and spectacular views of the Ahwatukee Foothills! Highly rated Desert Vista High School. 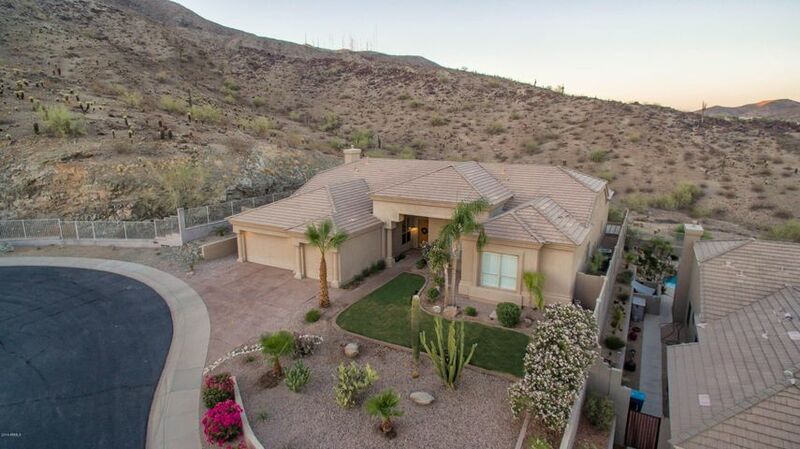 Amazing Ahwatukee Foothills location! Great value!! MLS #5775111. Currently pending with a list price of $799,000. Same floor plan. © 2019 Arizona Regional Multiple Listing Service, Inc. All rights reserved. The data relating to real estate for sale on this website comes in part from the Arizona Regional Multiple Listing Service. Real estate listings held by brokerage firms other than Phoenix Urban Spaces, LLC are marked with the Arizona Regional Multiple Listing Service logo and detailed information about them includes the name of the listing brokers. All information should be verified by the recipient and none is guaranteed as accurate by ARMLS. All properties are subject to prior sale, change or withdrawal. Neither listing broker(s) nor Phoenix Urban Spaces, LLC shall be responsible for any typographical errors, misinformation, misprints and shall be held totally harmless. Listing courtesy of Keller Williams Realty Sonoran Living. Listing data last updated Friday, April 26th, 2019 12:05:18 AM.